On left: Robert Towns, merchant and entrepreneur, 1873 / Creator Freeman Brothers. Call Number P1 / 1797. Digital Order No. a4364097. 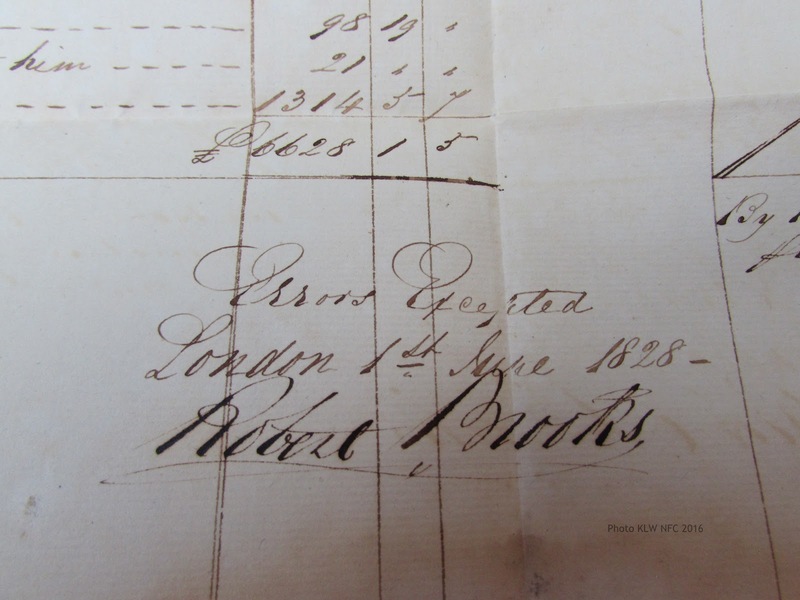 British ship owner, wool merchant, director of the Union Bank of Australia (UBA), investor in the London Wool Docks, and eventual owner of the Woodcote estate near Epsom (UK), the remarkable Robert Brooks (1790-1882) voyaged to Australia just once, on board the Elizabeth, departing Portsmouth (UK) on 9th March 1823, dropping anchor at Hobart, Van Diemen’s Land, on 12th July 1823, 125 days out. 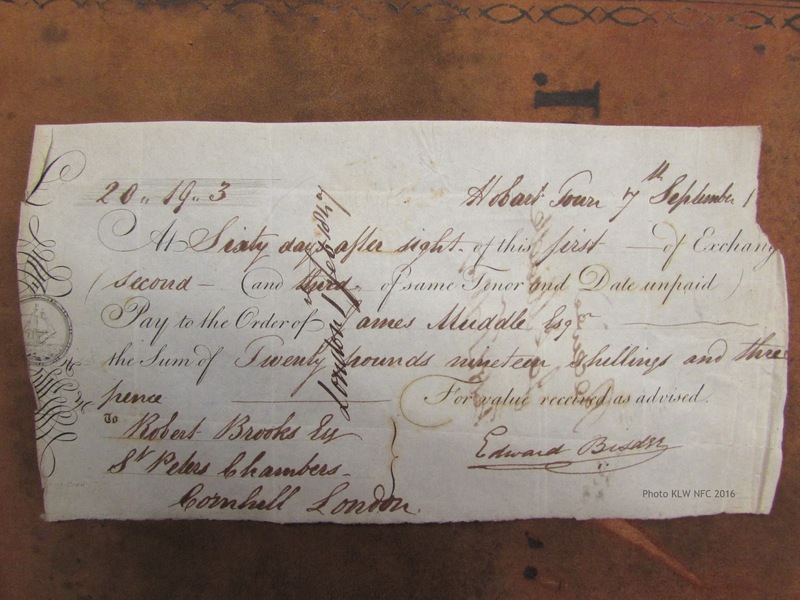 From this very profitable adventure in partnership with Ranulph Dacre, buying and selling timber, wool, sea elephant oil, and colonial produce on the inward and outward voyages, he established early a reliable network of agents with men such as Anthony Fenn Kemp in Hobart and Robert Campbell Jr in Sydney. 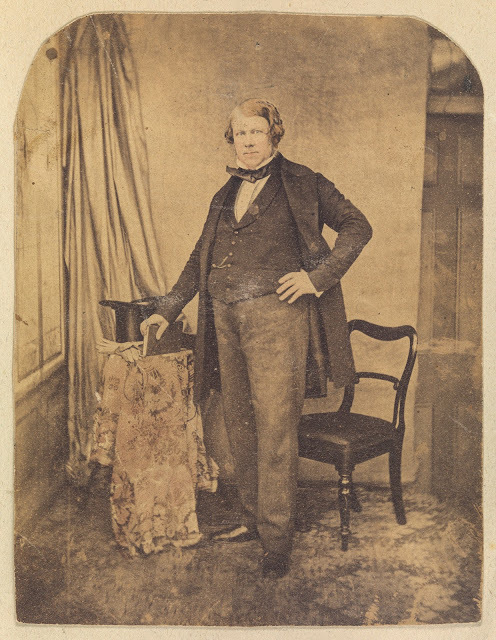 Ranulph Dacre was the owner of several ships, including the Wave which Captain Edward Goldsmith commanded to Van Diemen’s Land during the 1830s to the early 1840s, and with Alexander Fotheringham, the whaler Porteous. 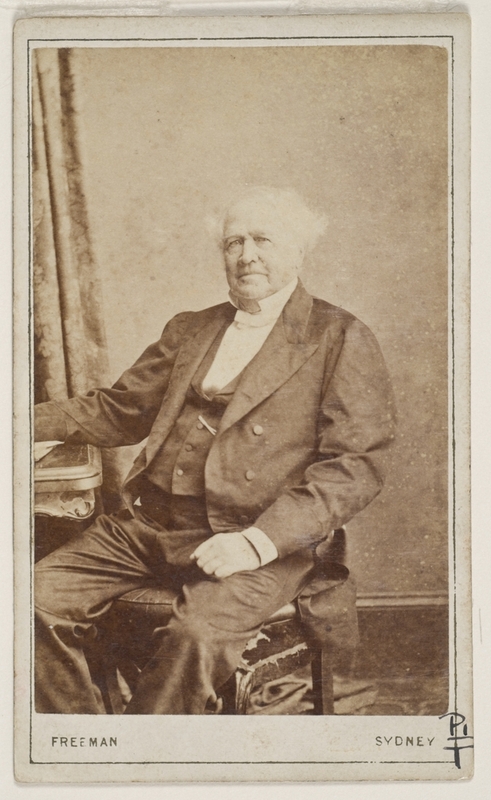 The success of this and other early ventures was short-lived, however, when Dacre faced bankruptcy, leading Brooks to seek out Sydney businessman Robert Towns (1794-1873) as his chief agent for two enterprises: expansion into the Australian wool trade, and promotion of assisted migration to Australia. The latter contributed to the rapid development of trade to the colonies in the 1830s but also led to a glut and slump in trade which did not recover until the mid 1840s. 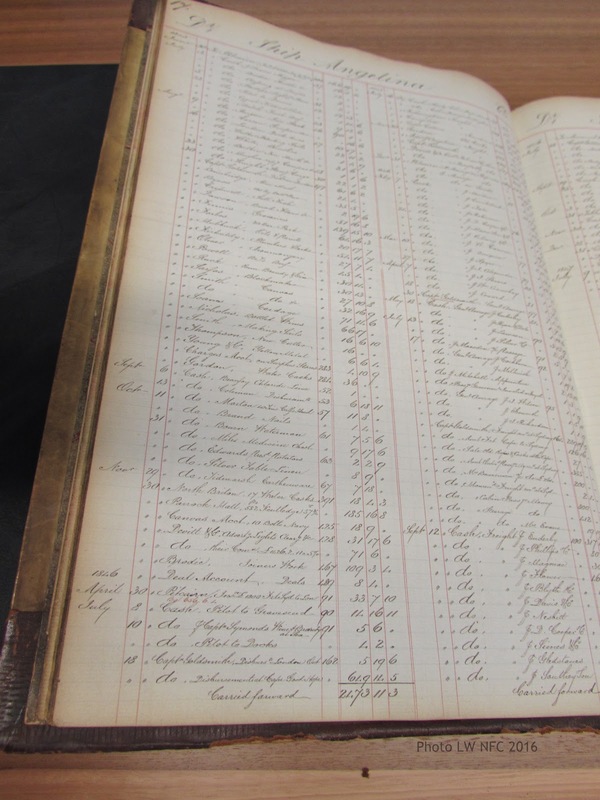 The long term success of Robert Brooks’ shipping and pastoral investments depended heavily on the trust he placed in his agents at colonial ports, and on his delegation of all responsibility to his ships’ masters. 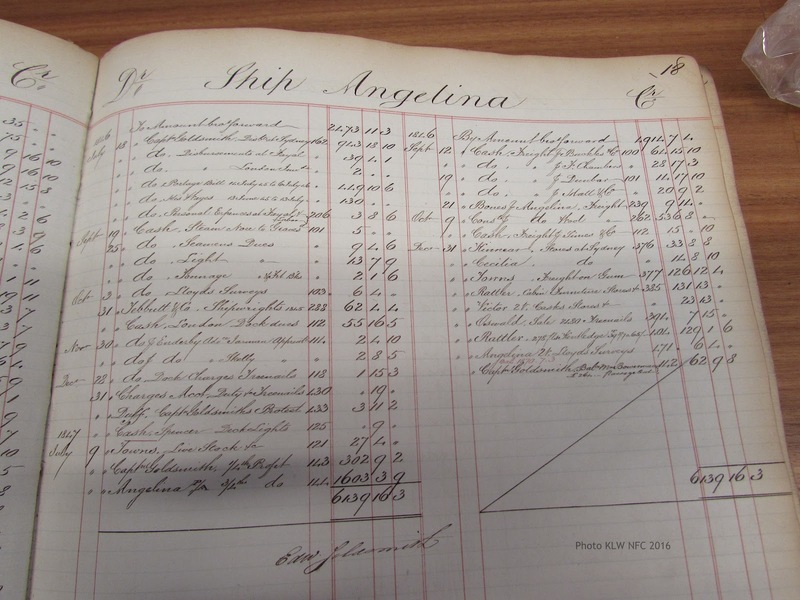 “Freight payable in the colony” appeared frequently on his cargo manifests. 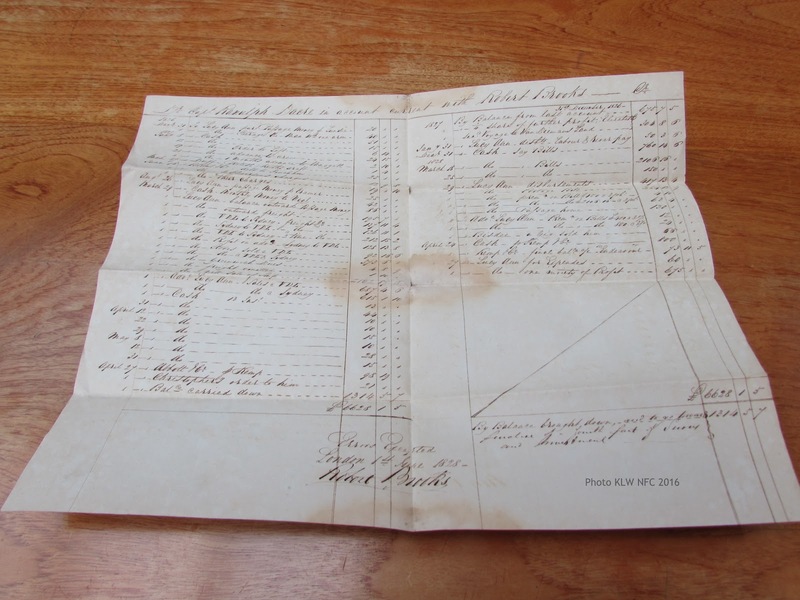 Between 1834 and 1836 he purchased eight vessels, all second-hand. 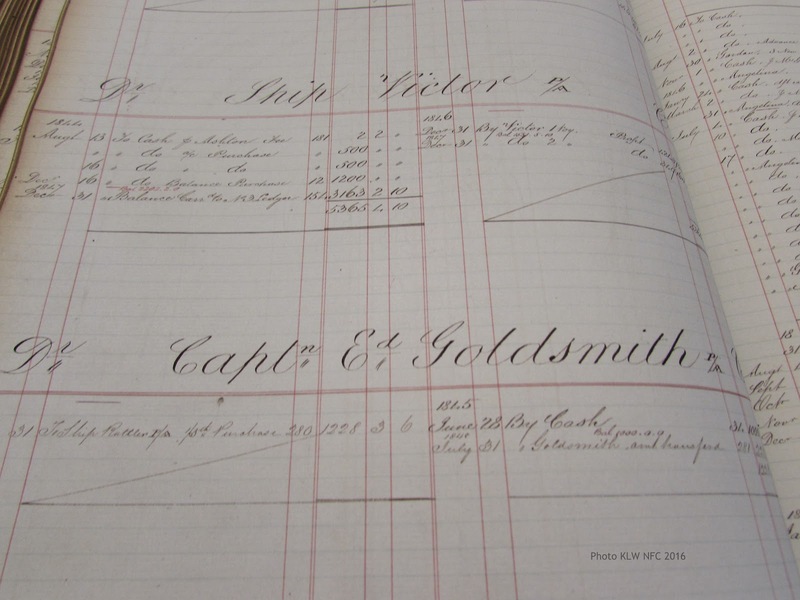 Between 1844 and 1846, his shipping purchases included the Parrock Hall, the Victor, the Kinnear, the Angelina, the North Briton, the Eagle, the William Wilson, and most important of all, the Rattler, built and bought specifically for Captain Edward Goldsmith (Broeze, p. 150, Table 8.6). Captain Goldsmith of the Parrock Hall making his first voyage for Brooks, through his connection Thomas Chapman arranged that the Aden loaded home at Hobart. 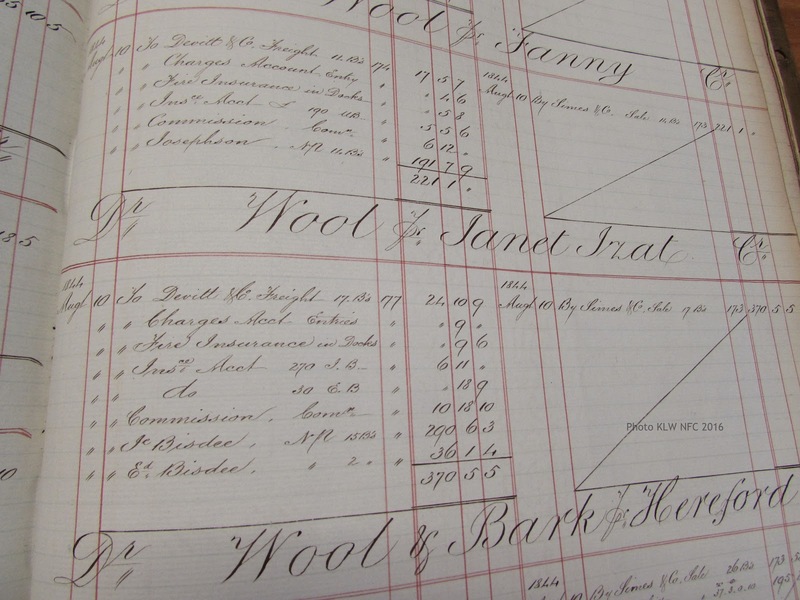 at the excellent rate of 1½ d per 1lb wool and £5 5s per ton for whale oil …. The new link proved so satisfactory that … Brooks turned incidental deployment into permanent commitment. 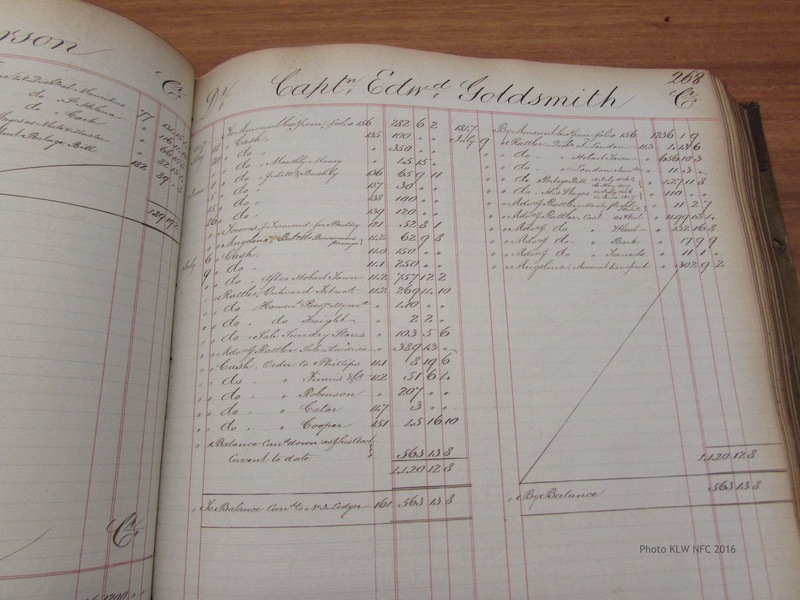 Building on Captain Goldsmith’s reputation and the strength of his connections with Devitt & Moore in London and Thomas Chapman at Hobart, he bought a new ship for Goldsmith, to be employed as a ‘regular trader’ i.e. on a permanent shuttle service between London and Hobart. 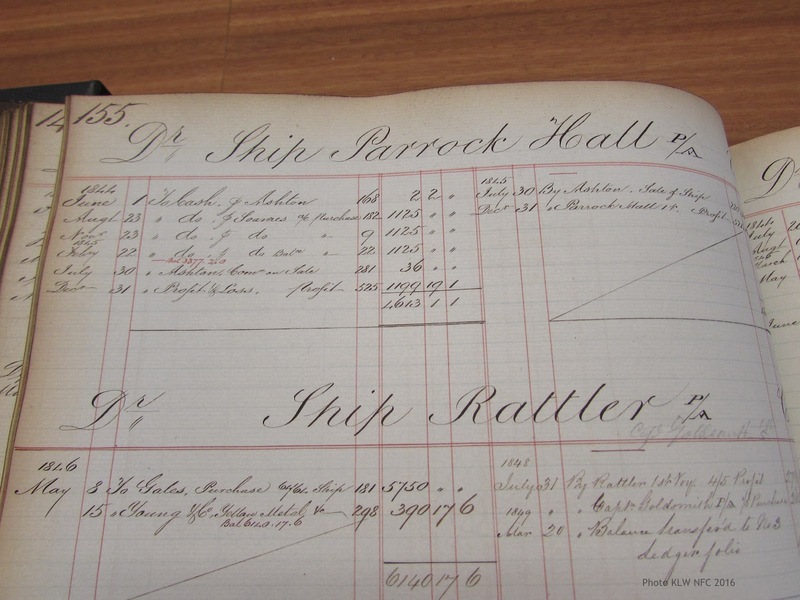 The Rattler, of 522 tons, NM, was a large ship for the Hobart trade and at £5750 was Brook’s most expensive yet. But he estimated the capabilities of his agents correctly. 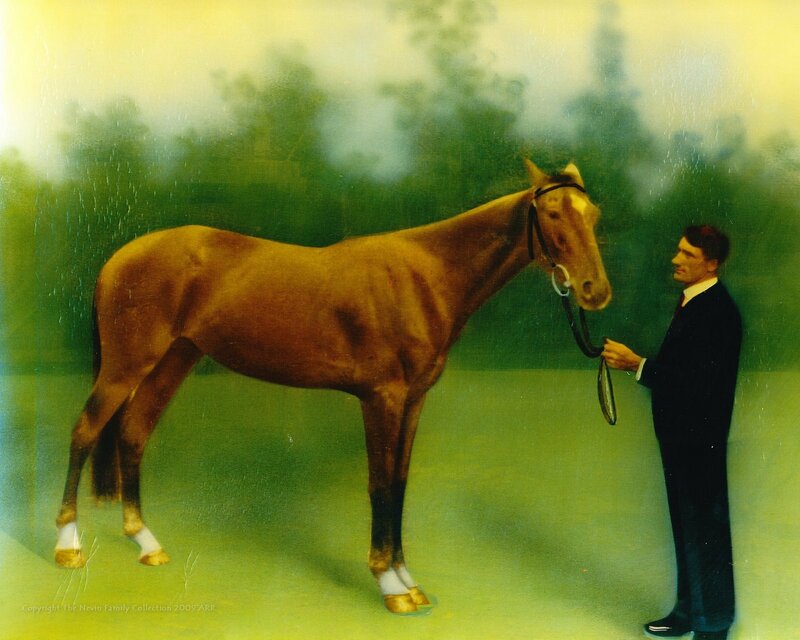 Devitt & Moore despatched the ship with sufficient rapidity to ensure that her arrival at Hobart was perfectly timed for the coming wool season. She reached Hobart on 11 November 1846 and was immediately advertised as a ‘new and remarkable fast barque’ to sail in early January. Despite her size, Chapman loaded her in a little over two months. Until 1851/52 the Rattler maintained an annual shuttle service based on the rhythm of successive wool seasons. 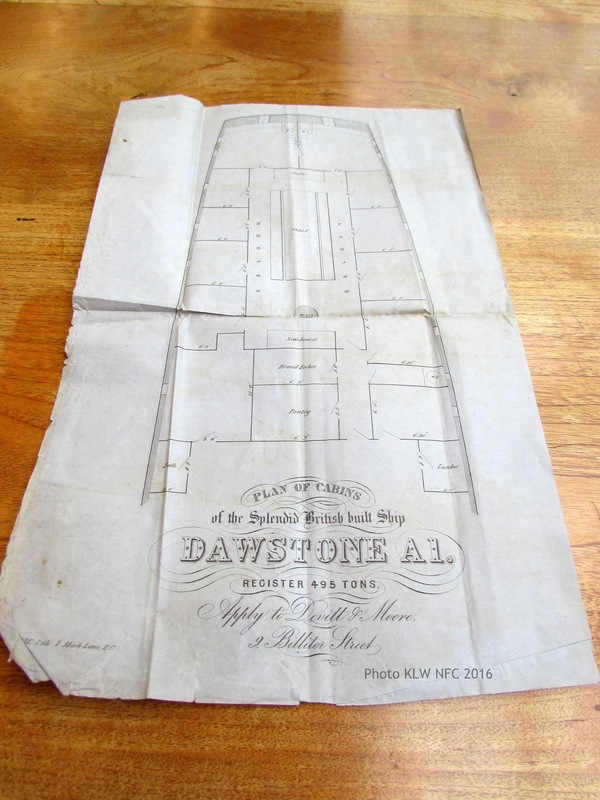 In principle, such a schedule, supported by influential brokers at either side, formed the solution to the problem of the British shipowner in finding continuous employment in the Australian trade. 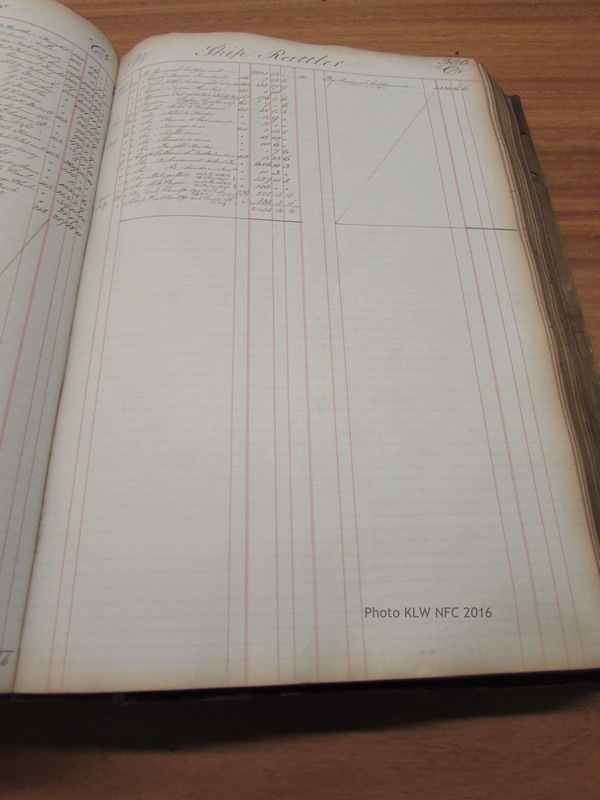 The slightest delay in loading or on the passage could fatally disturb the annual rhythm …. 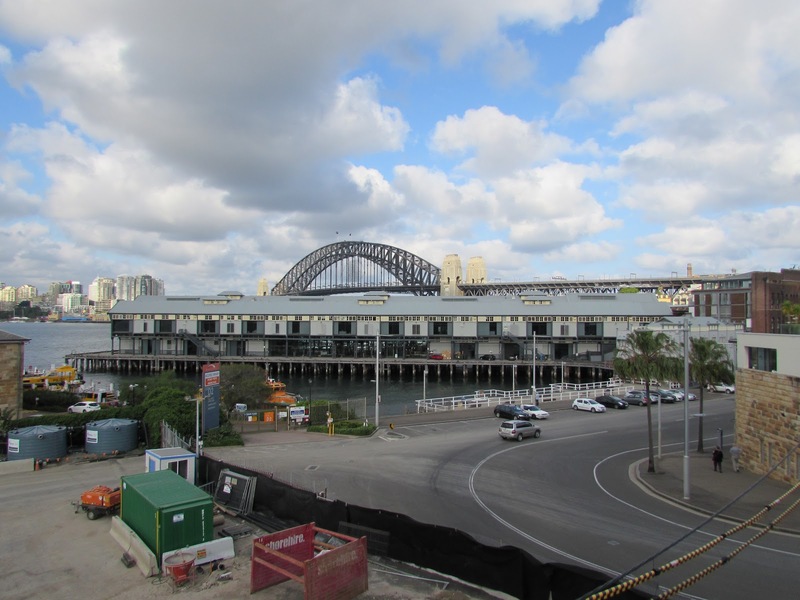 In Sydney it occurred only rarely that a ship loaded home in more than two successive years…. But only at Hobart were several independent freight carriers able to achieve sustained shuttle employment. With a shorter sea passage to and from Britain and a more compact hinterland than Sydney the chances of delays were much reduced (Broeze 1993:153-4). 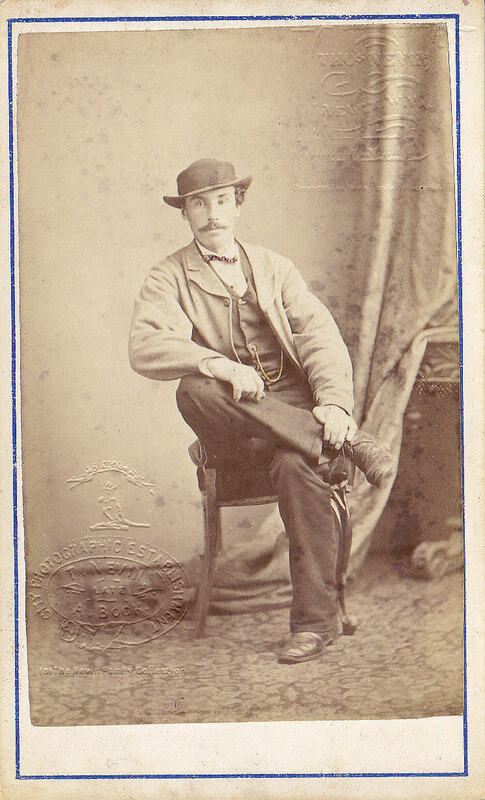 Captain Edward Goldsmith and the Rattler were a fixture in the Hobart trade, having completed six consecutive seasons from 1846/7 to 1851/2. Thomas Chapman’s agency ensured a rapid turnaround. but the ship and its master gradually lost time against the ‘seasonal clock’, arriving at London Docks on 17 May, 8 June, 23 June, 1 July, 16 July and 17 July in consecutive seasons. 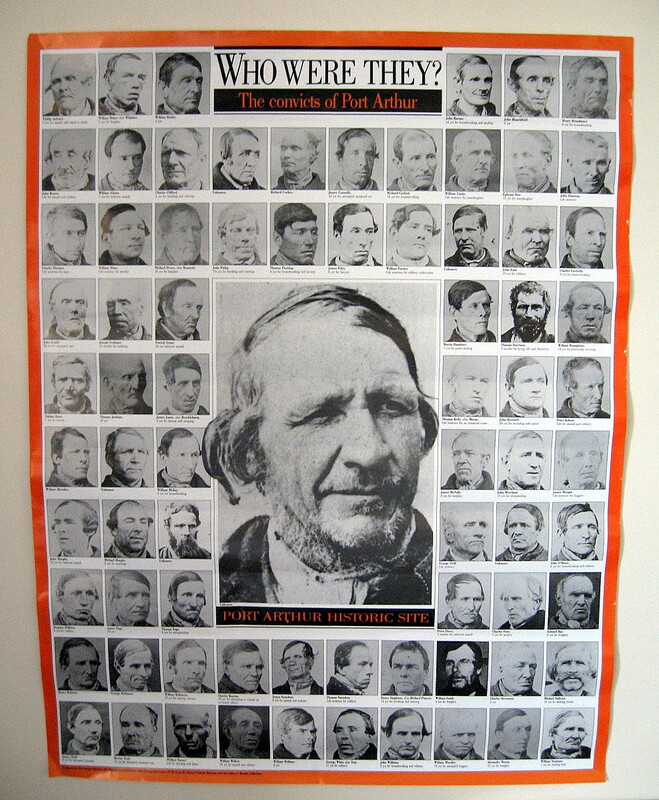 Although put on berth at Hobart in 1852 awaiting cargo, Brooks had few choices but to accept a charter of migrants to Sydney. 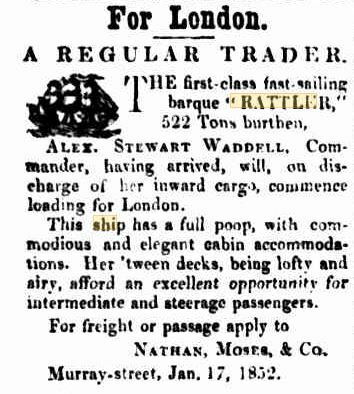 The Rattler was sold along with the Bangalore on its return to London in 1853 (Broeze, p. 223) under the command of Captain Wardell. Frank Broeze. Carlton, Vic. 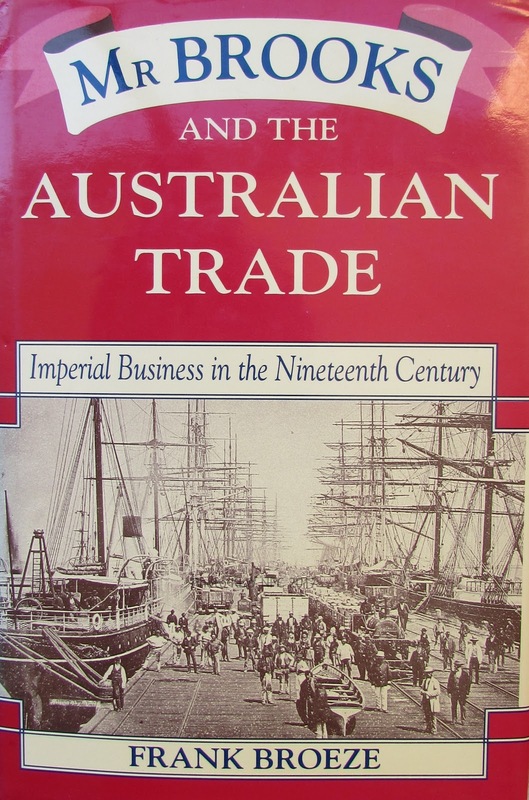 : Melbourne University Press, 1993. xi, 375 p.,  p. of plates : ill., map, ports. ; 24 cm. 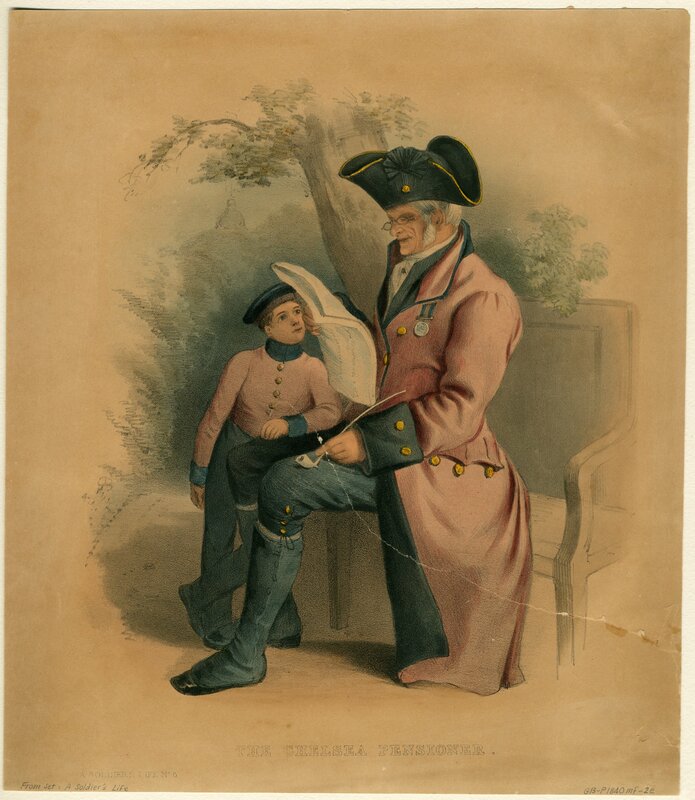 Captain Goldsmith, with wife Elizabeth and their two sons Richard and Edward jnr were to spend the next two years in the colony at their residence, 19 Davey Street Hobart, while Captain Goldsmith embarked on the construction of the SS Kangaroo, a vehicular ferry designed for travel between Hobart Town and the eastern shore of the River Derwent. 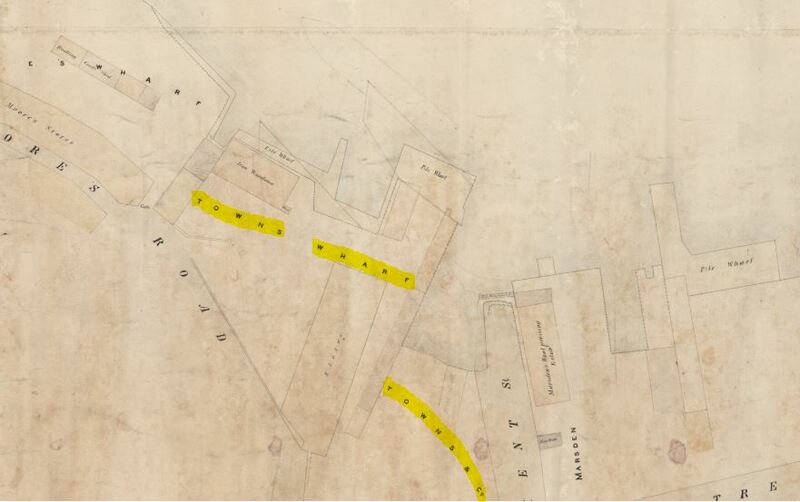 He also built a number of smaller vessels including a 25 ton schooner, and commenced the first phases of a patent slip at his shipyard on the Queen’s Domain before mitigating circumstances arrested its progress, caused in principal part by extensive delays in obtaining adequate finance and materials from the colonial government. 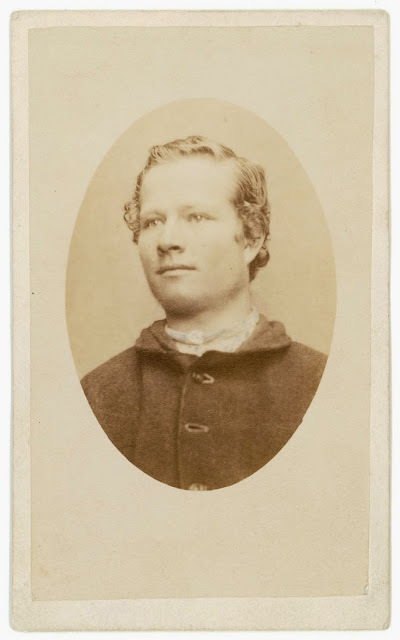 The death of first-born son Richard Sydney Goldsmith, 24 years old in 1854, from typhoid fever while working at the Union Bank in Hobart was no doubt the tipping point. 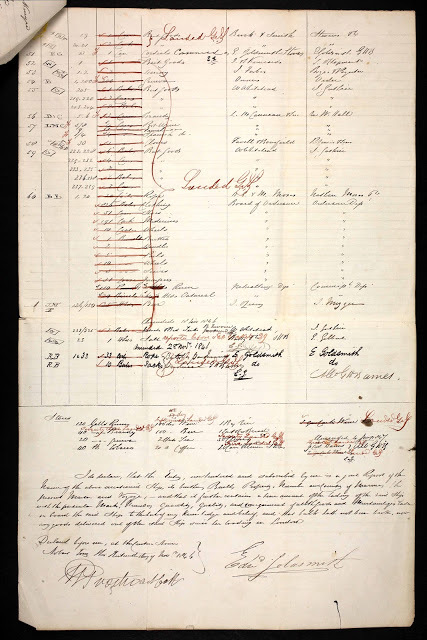 Captain Edward Goldsmith, wife Elizabeth and younger son Edward Goldsmith jnr departed Tasmania on the Indian Queen as passengers bound for Liverpool in February 1856, never to return to Tasmania. They settled back at Gad’s Hill House, in the village of Higham, Kent (UK), where they found their new neighbour was none other than Charles Dickens. Captain Goldsmith’s nieces, Elizabeth Rachel Day and Mary Sophia Day, daughters of his brother-in-law, former first mate and navigator Captain James Day, remained in Hobart. 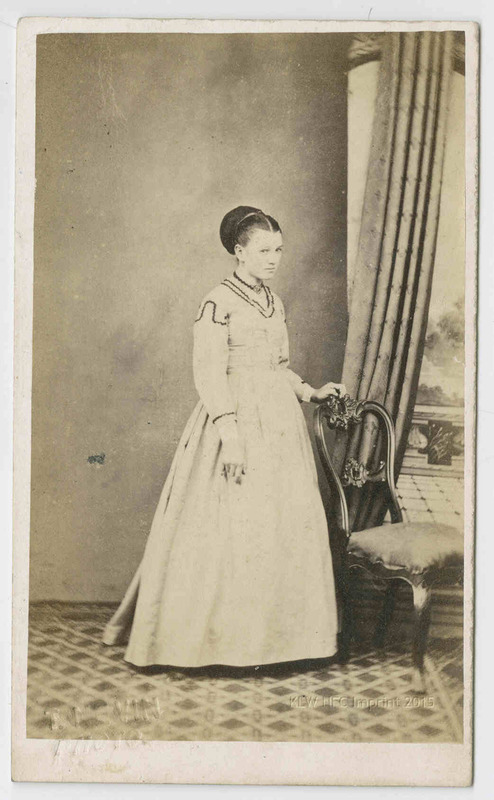 By 1871 Elizabeth Rachel was married to photographer Thomas J. Nevin, and by 1878, her younger sister Mary Sophia was married to mariner Captain Hector Axup. 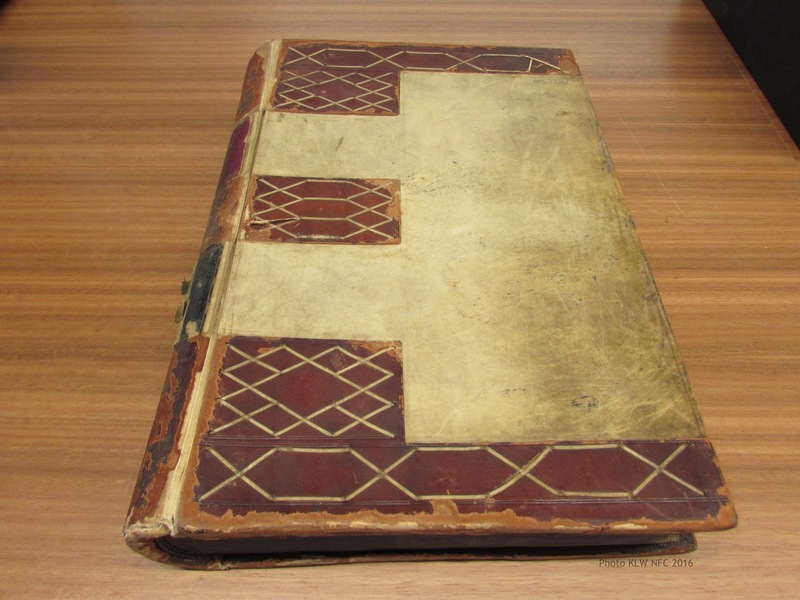 These original documents are held in two Australian collections: the National Library of Australia and the Mitchell Library, State Library of NSW. 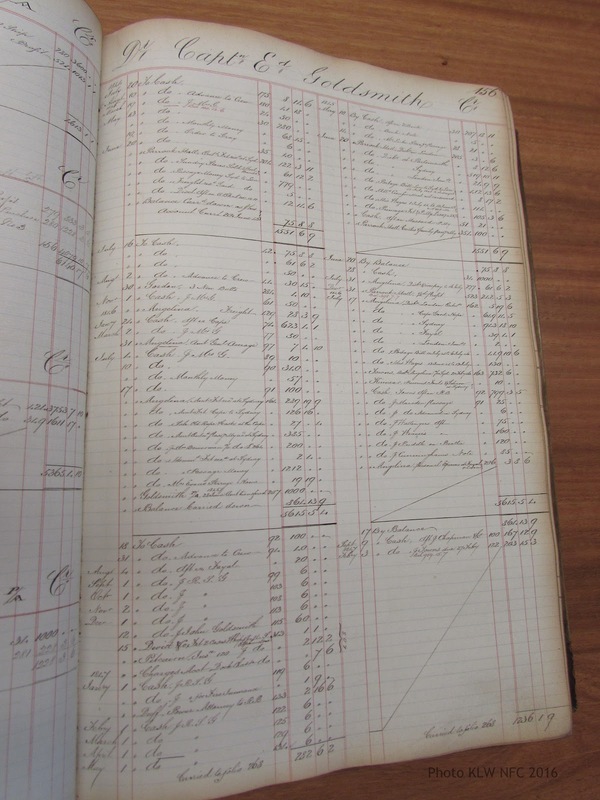 One idiosyncratic aspect of Robert Brooks’ character commented on by all who conducted business with him was the meticulous care he took with double entry bookkeeping at his counting house, where he only ever employed a handful of clerks (Broeze, p.294). 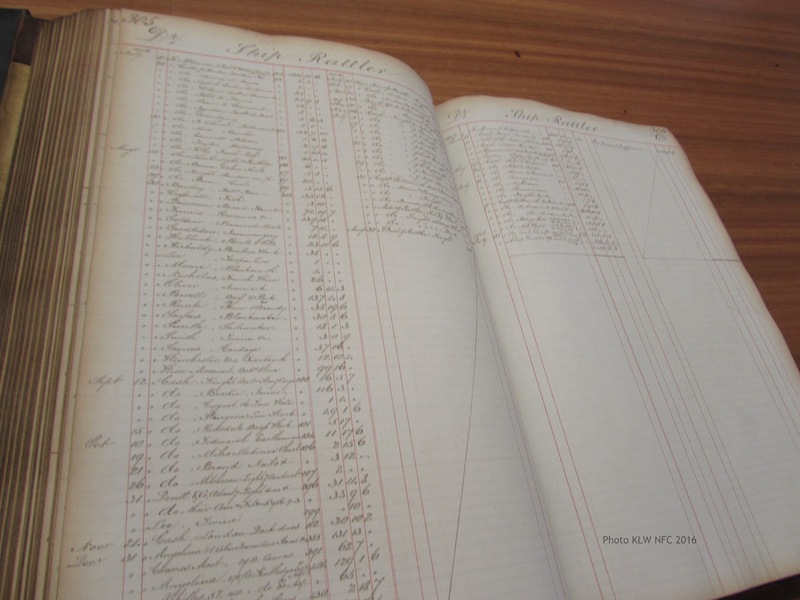 Click to view examples in these photographs taken from the Australian collections of Brooks’ accounts and correspondence with agents and ships’ masters. 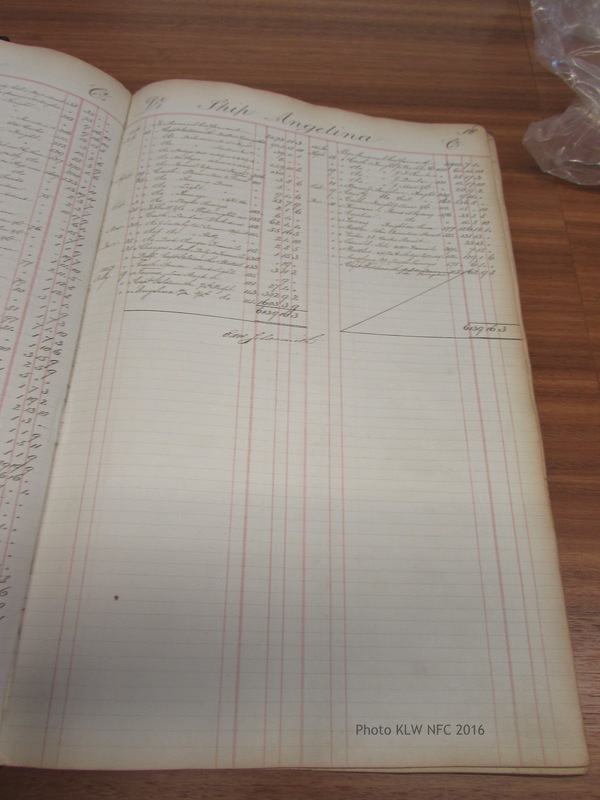 Records of Robert Brooks and Co.
Robert Brooks and Co & Robert Towns and Co. (1822-1890). 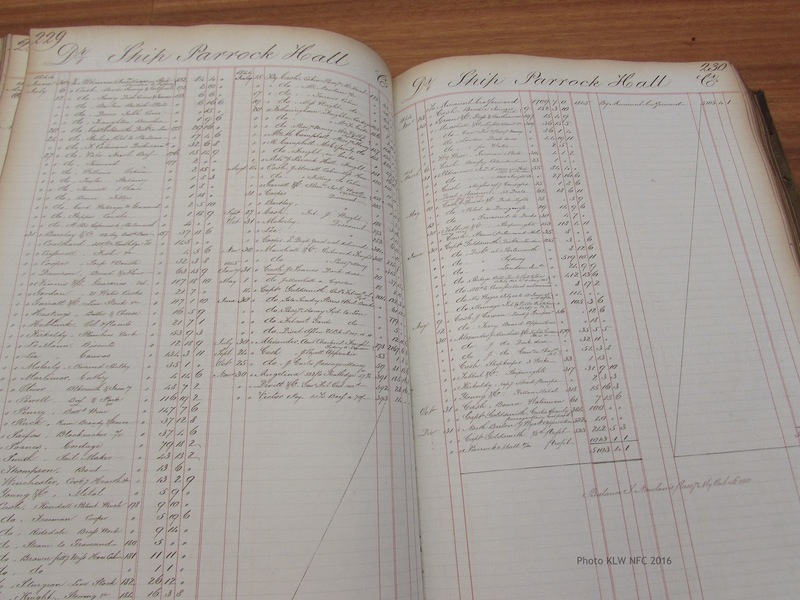 MS 2381 comprises 11 volumes of records documenting the business affairs of merchants and wool importers, Robert Brooks and Co. in 1841-1876. 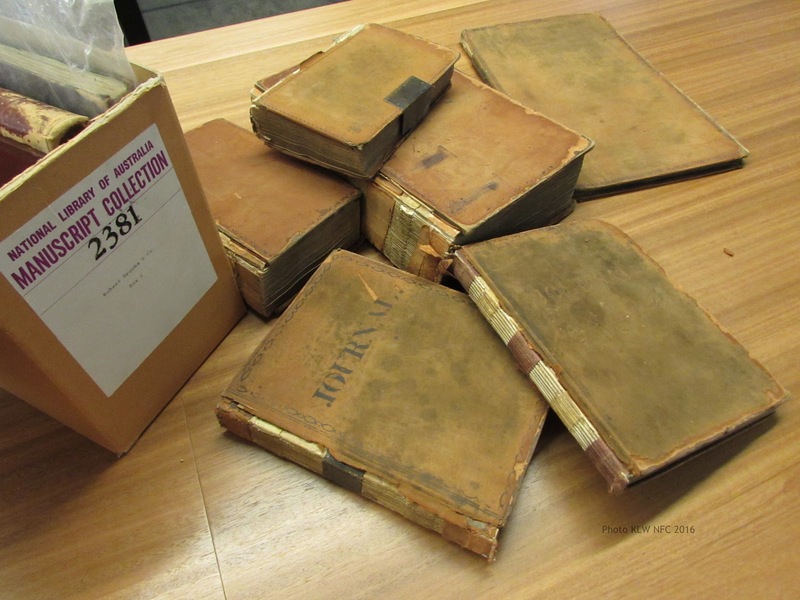 The collection includes two letterbooks, two journals and two ledgers, among other records (2 boxes, 2 fol. boxes, 1 elephant folio). 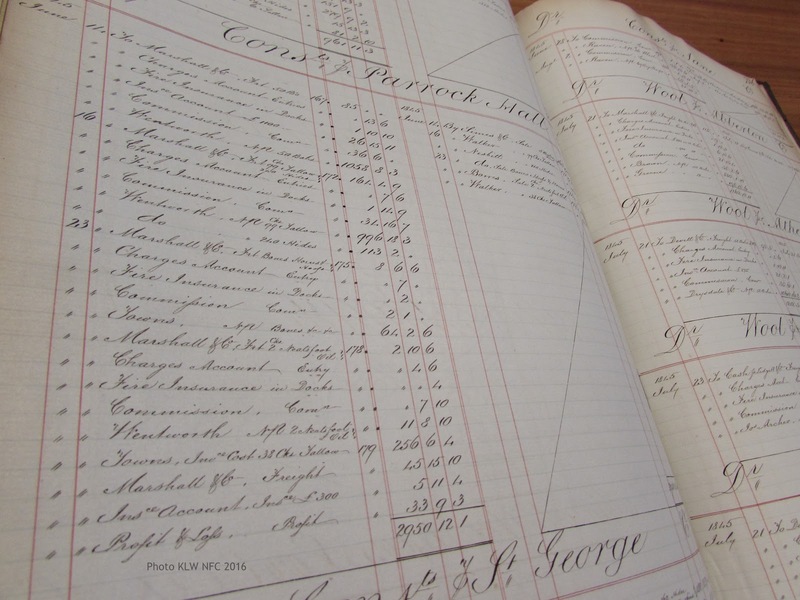 Further business correspondence, 1862-1890, is available on microfilm. 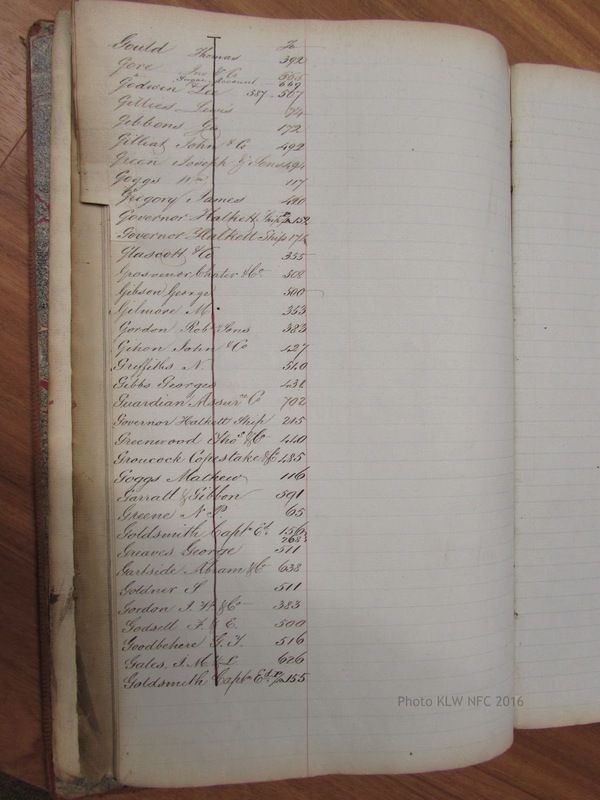 MS 2381-Records of Robert Brooks and Co., 1822-1890 [manuscript]. 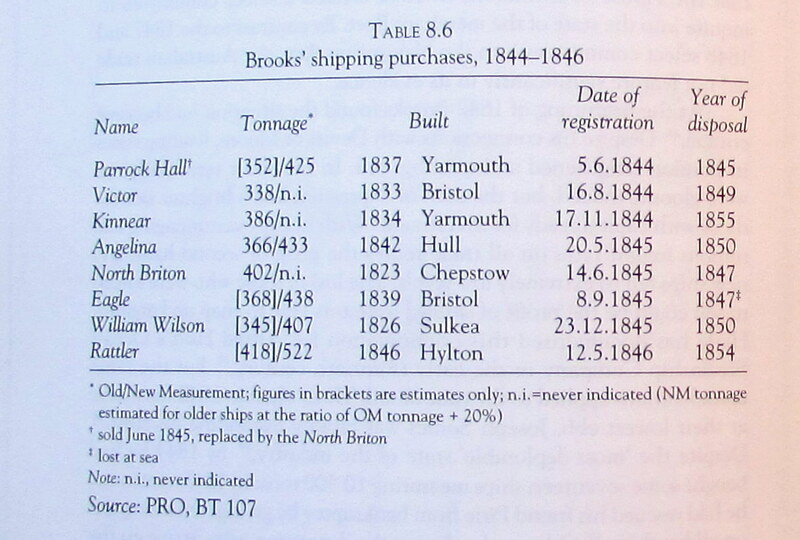 Sat 24 Jan 1846 Page 21 SHIPS IN HARBOUR. 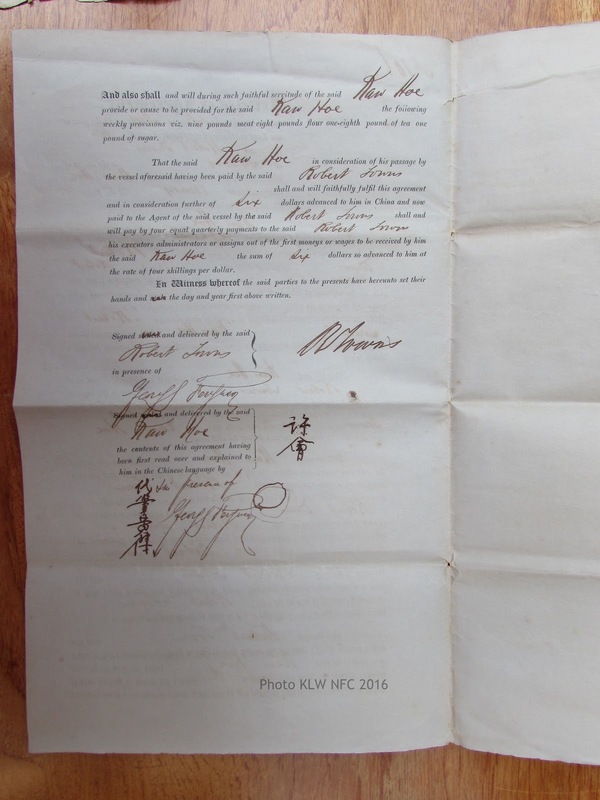 Edward Bisdee of Van Diemen’s Land, submitted a bill to Brooks to pay a Mr Muddle twenty pounds, nineteen shillings and three pence. 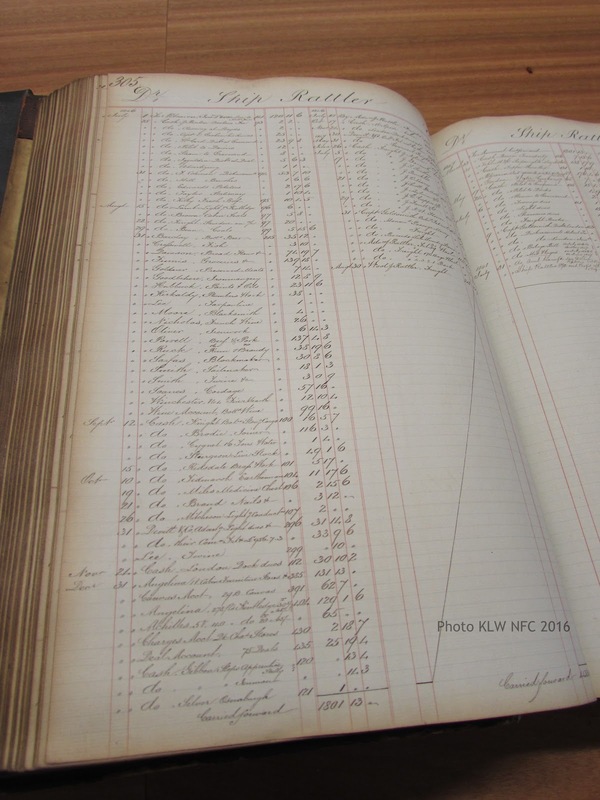 Above: the index to the ledger below. 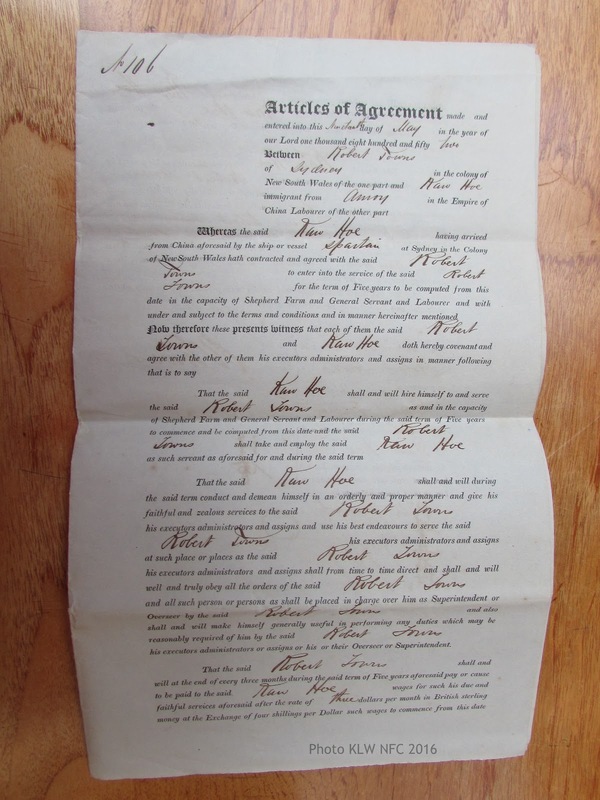 We also agree to stow the Dead Weight on board the above Vessel, at Nine Pence per Ton. 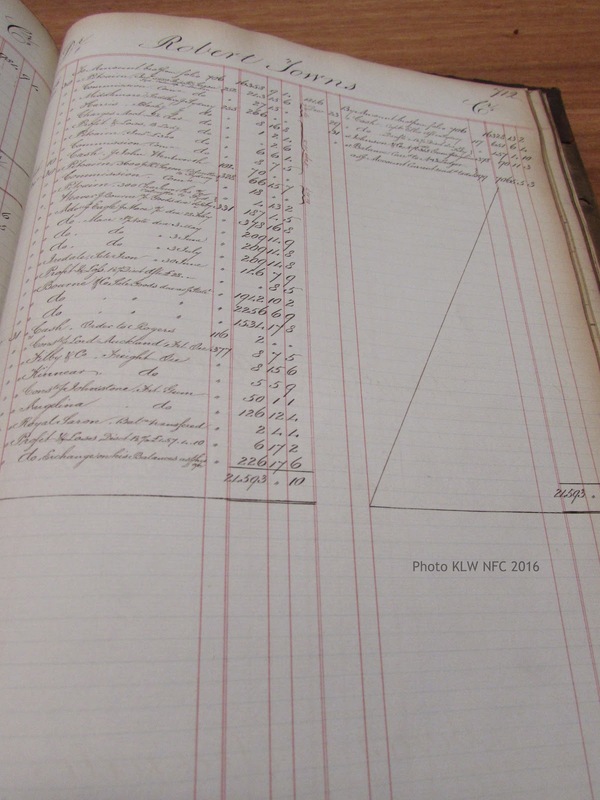 Ship finding labour …. 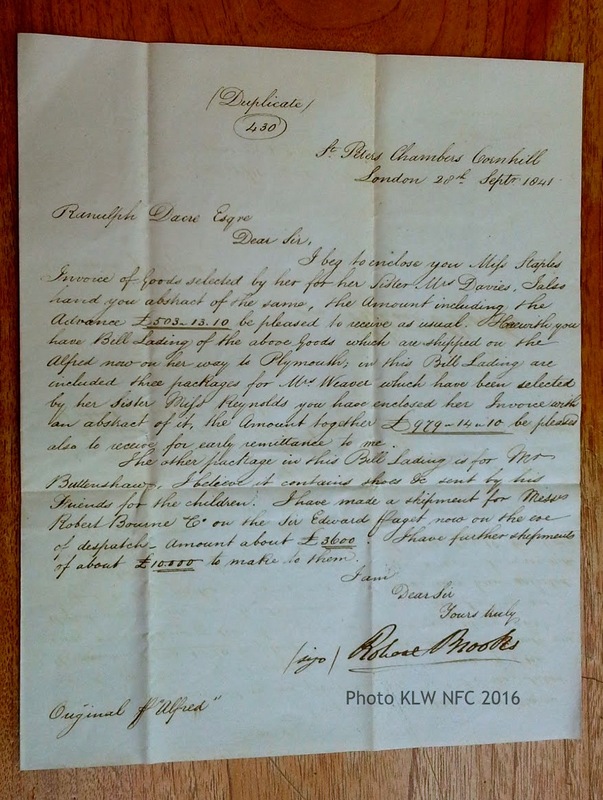 On Tuesday, November 5th, 1844, Captain Edward Goldsmith sailed into Sydney Harbour in command of the merchant barque the Parrock Hall, 425 tons, departing Portsmouth on July 22, 1844, bringing mail, cargo and passengers via the Cape of Good Hope. The voyage was exceptionally fast (105 days). 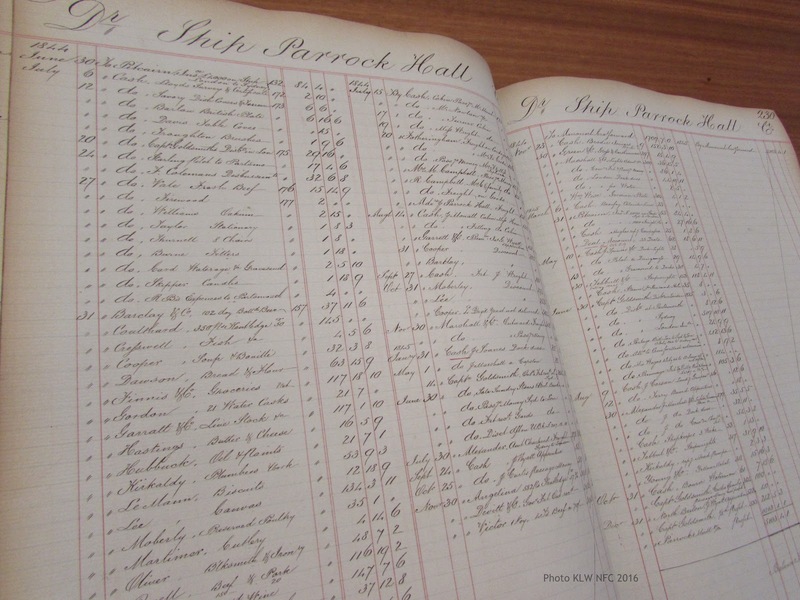 According to The Shipping Gazette and Sydney General Trade List of Nov. 9th, “she had a fine passage” and on the way, “she did not speak any thing.” The ship may have acquired its name from the old manor of Robert de Parrock, where Parrock Avenue and Parrock Road are now located in Gravesend, Kent, UK. Parrock Hall was built by Peter Moulson, Lord of the Manor of Milton, in 1761, and by 1821 it was owned by Colonel Dalton. In 1991, Parrock Hall, a Grade II listed building, was said to be in a dilapidated state with calls for its preservation. “A very fine day” was how journalist and playwright David Burn described Tuesday, November 5th 1844, in his diary (SLNSW Call No. B 190 / 2). He was watching the signals on Flagstaff Hill, Millers Point, for news of Captain Goldsmith’s arrival in Sydney Harbour. 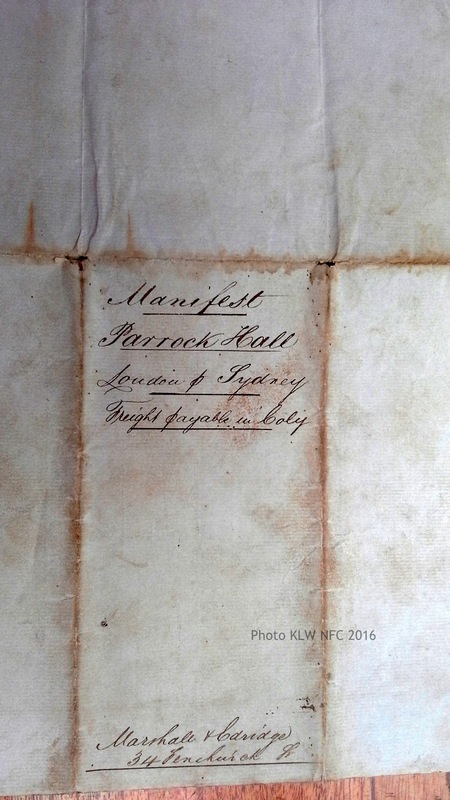 The Marryat flag for the Parrock Hall, No. 9376, signalled the barque as it sailed on towards Fotheringham’s Wharf “in the Cove” where it would remain until being cleared out for London on January 15th, 1845. 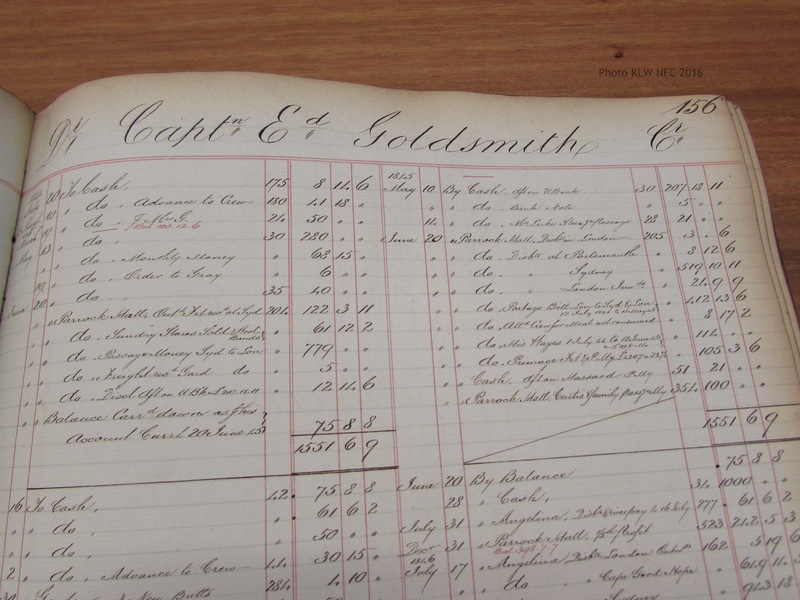 Read the rest of this post here about Captain Goldsmith and David Burn. 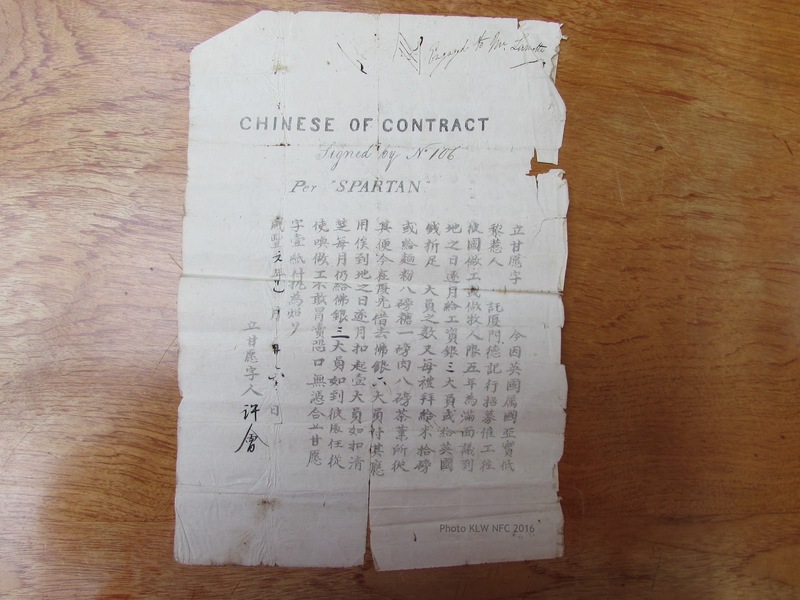 Source: The Sydney Morning Herald (NSW : 1842 – 1954) Wed 6 Nov 1844 Page 2 IMPORTS. 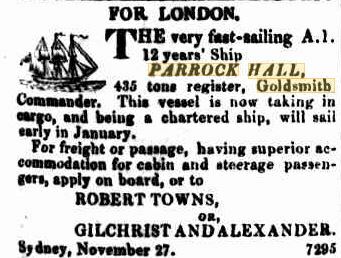 November 5.Parrock Hall, barque, 424 tons, Captain Goldsmith, from London : 1 box apparel, A. 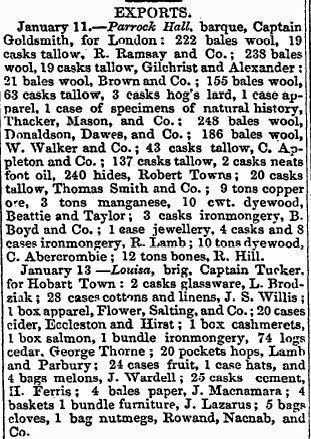 Gravely; 6 tierces tobacco, Thomas Smith and Co. ; 3 casks lead, Watkin ; 28 kegs 12 tierces tobacco, Smith and Campbell; 30 hogsheads and 50 barrels beer, and 100 casks bottled beer, Lyall, Scott, and Co.; 12 cases, 1 cask, 5 bales, 60 coils line, and 6 coils rope, 20 firkins, 4 casks oil, and 1 box, F. Whit-worth; 1 case, F. Mitchell; 4 cases, J. and S. Willis; 4 bales slops, 33 tierces tobacco, 4 bales slops, 20 trunks shoes, and 8 bales shirts, Lamb and Parbury; 1 case apparel, and 1 box candles, Bishop of Australia ; 2 boxes black lead, Ray and Glaister; 43 hogsheads rum, R. Towns ; 1 case silver plate, Miss Howe ; 1 case silver plate, R. Campbell, junior; 100 hogs-heads beer, 100 casks bottled beer, 1 case, and 4 bales, Flower, Salting, and Co. ; 1 case ap-parel, J. Purser; 2 cases apparel, and 3 bales, Rev. 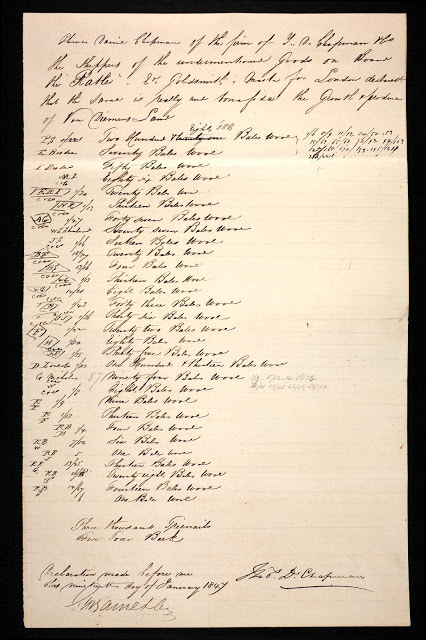 Dr. Ross ; 1 case, W. Walker and Co. ; 1 parcel books, Colonel Shadforth ; 8 trusses and 1 trunk, J. J. Giblett ; 7 packages plate glass, Solomon ; 5 boxes soap, Miss Wright; 3 bales and 8 cases, M. Joseph; 1 case, Quaife ; 1 case books, W. A. Colman; 1 case and 1 trunk, J. G. Raphael, 1 case, Fullerton; 1 case, Mr. Hamilton ; 8 bales, 19 cases, H. G. Smith ; 33 cases and 39 bales, 29 1/2 tierces, and 5 tierces tobacco, Griffiths, Gore, and Co. , 1 case, D. Davis ; 1 case, J. F. Milne , 2 cases, 2 trunks, 1 bale, Swain, Webb, and Co ; 1 case, G Mason ; 45 coils rope, A. Fothering-ham ; 1 case, 10 bales, 5 trunks, T. Smith and Co ; 30 hogsheads beer, 3 cases whips, E. Goldsworth ; 3 bales and 3 cases, R. Ramsay, sen., and Co. ; 1 case preserves, J. Parnell; 8 cases cottons, Dreutler and Wagner ; 38 cases Portugal wine, E. C. Weekes ; 1 box boots, Judge Stephen ; 36 bales linens, 8 cases sta-tionery, 28 casks shoes, I bundle measures, 4 bundles tarpaulins, 9 bundles, 38 table boards, 79 kettles, 52 pots, 50 shovels, 27 pieces iron, 400 ash felloes, 12 spades, 3 coils rope, 1 hand-cart, 100 fathoms cable, 4 gun-carriages, 4 handspikes, 16 bundles iron, 5 baskets oil, 10 cases iron work, Government stores ; 1 case (a carriage), 1 case hardware, 34 casks bottled, and 1 hogshead beer, order. R. Towns, agent. January 15. Parrock, Hall, barque, Captain Goldsmith for London. 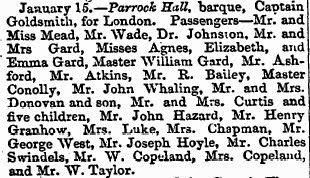 Passengers – Mr. and Miss Mead, Mr. Wade, Dr. Johnson, Mr. and Mrs Gard, Misses Agnes, Elizabeth, and Emma Gard, Master William Gard, Mr. Ashford, Mr. Atkins, Mr. R. Bailey, Master Conolly, Mr. John Whaling, Mr. and Mrs. Donovan and son, mr. and Mrs. Curtis and five children, Mr. John Hazard, Mr. Henry Granhow, Mrs Luke, Mrs. Chapman, Mr. George West. 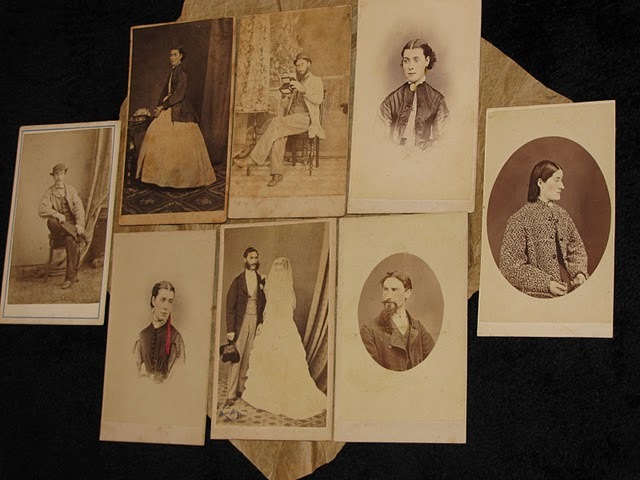 Mr. Joseph Hoyle, Mr. Charles Swindels, Mr. W. Copeland, Mrs. Copeland, and Mr. W. Taylor. 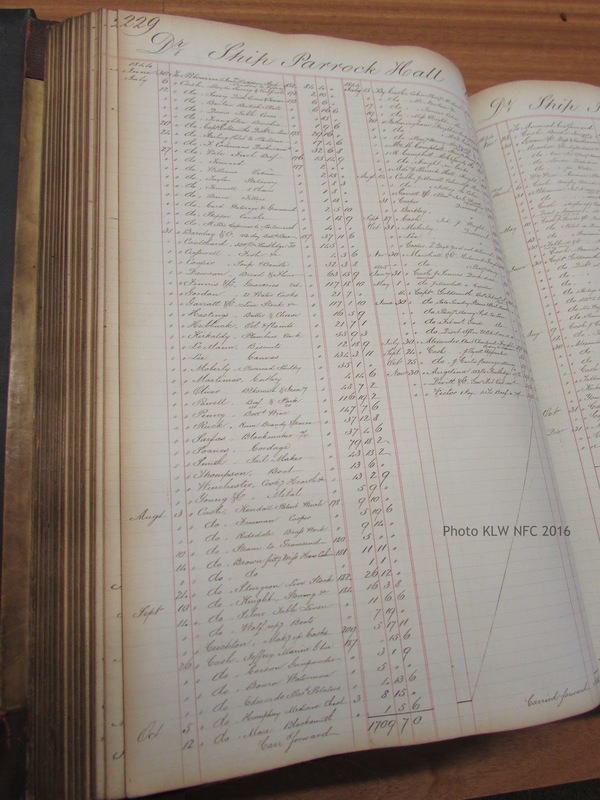 Source; The Shipping Gazette and Sydney General Trade List (NSW : 1844 – 1860) Sat 11 Jan 1845 Page 10 VESSELS LAID ON FOR ENGLAND. neats’-foot oil, and 200 salted hides, on board. 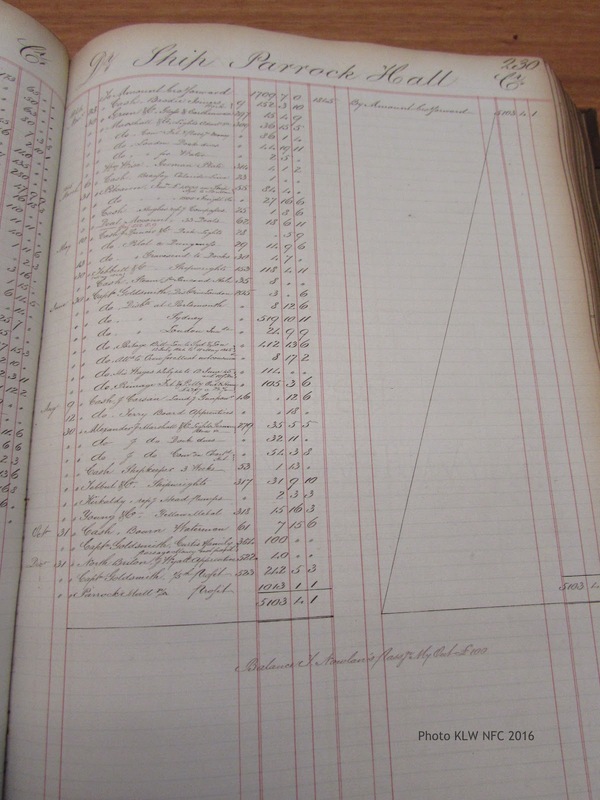 Exports: January 11th, 1845, the Parrock Hall and January 13th, the Louisa. 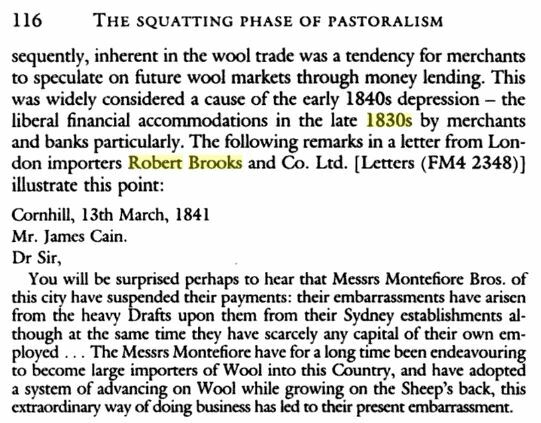 “The Messrs Montefiore have for a long time been endeavouring to become large importers of Wool into this country, and have adopted a system of advancing on Wool while growing on the Sheep’s back, this extraordinary way of doing business has led to their present embarrassment”. 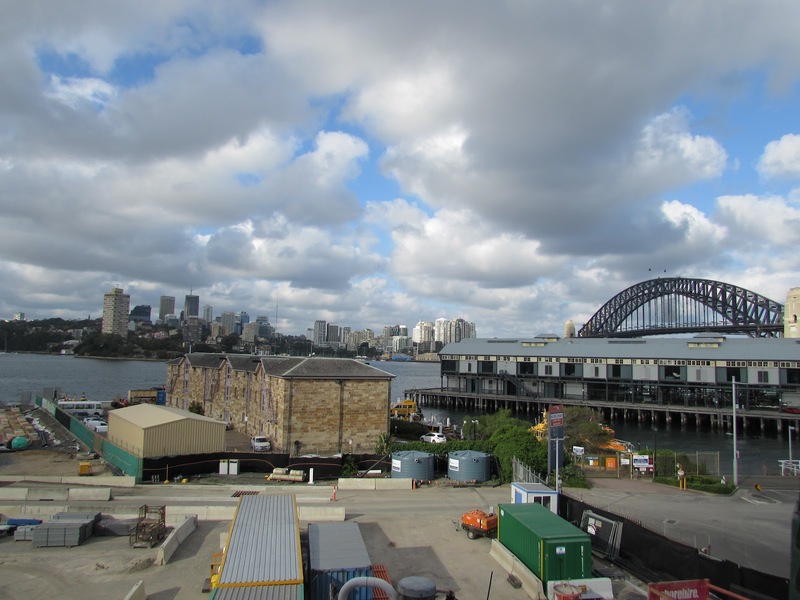 For a comprehensive history of the Barangaroo south archeological excavations 2012, view this report. Casey & Lowe report to Lend Lease. 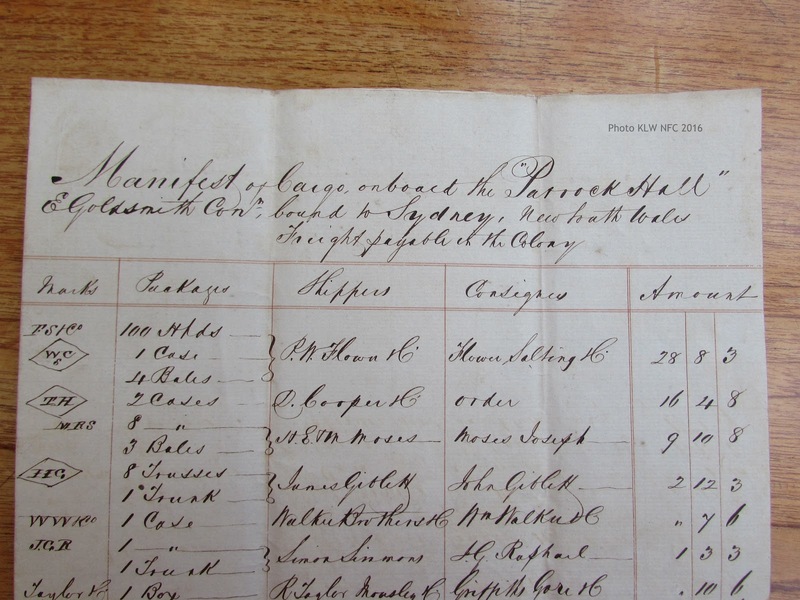 Before taking command of the Rattler in July 1846, Captain Edward Goldsmith was in command of the barque Angelina on the return voyage to London from the round trip to Sydney NSW when he had a narrow escape. The Angelina, 434 tons, laden with produce and 36 passengers, had cleared the Heads at Sydney on February 22nd 1846, but two weeks later, on 7th March as the barque entered the Southern Ocean nearing Cape Horn, the Angelina was struck by an iceberg, sustaining damage to the foredeck and losing the bowsprit. 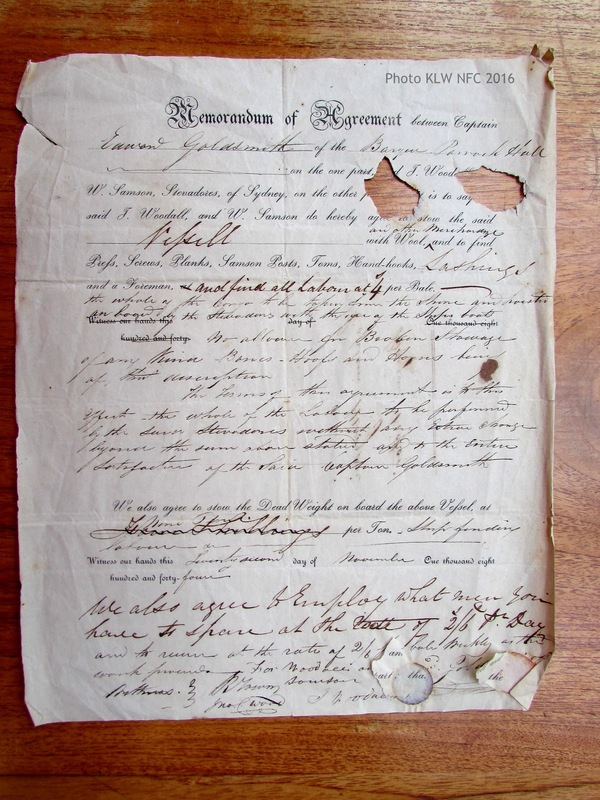 Delayed a week at Rio de Janeiro for repairs, Captain Goldsmith sailed the Angelina safely back past Portsmouth on the 4th July 1846. Barely twenty days back on shore in London, he was ready – and so was his wife Elizabeth Goldsmith – to set sail again. 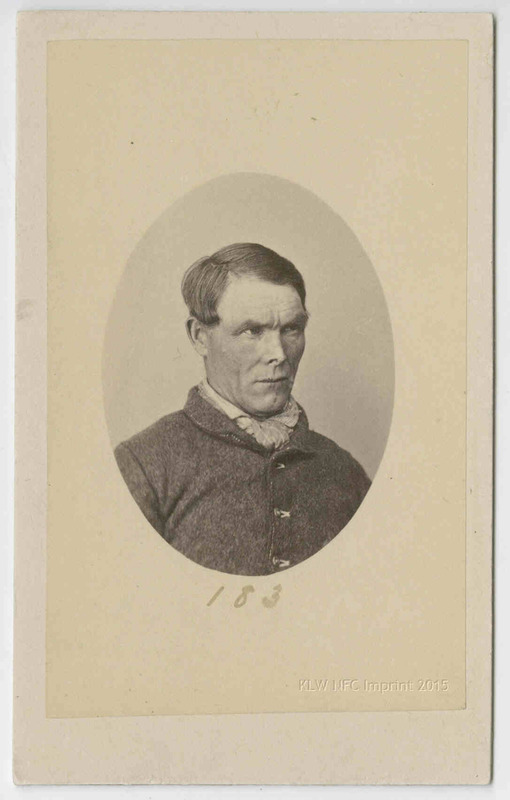 He took command of the Rattler, new off the stocks, on 24th July 1846, his sights set once more for Van Diemen’s Land. 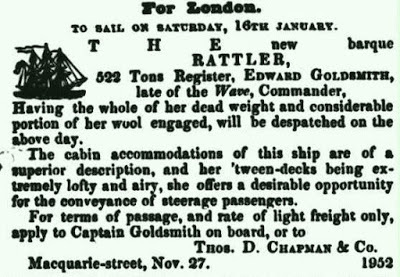 Elizabeth Goldsmith (nee Day, 1802-1875) sailed on the Rattler‘s maiden voyage with her husband Captain Edward Goldsmith in command, departing London on 24th July 1846, arriving at Hobart, Van Diemen’s Land (Tasmania) on 11th November 1846. 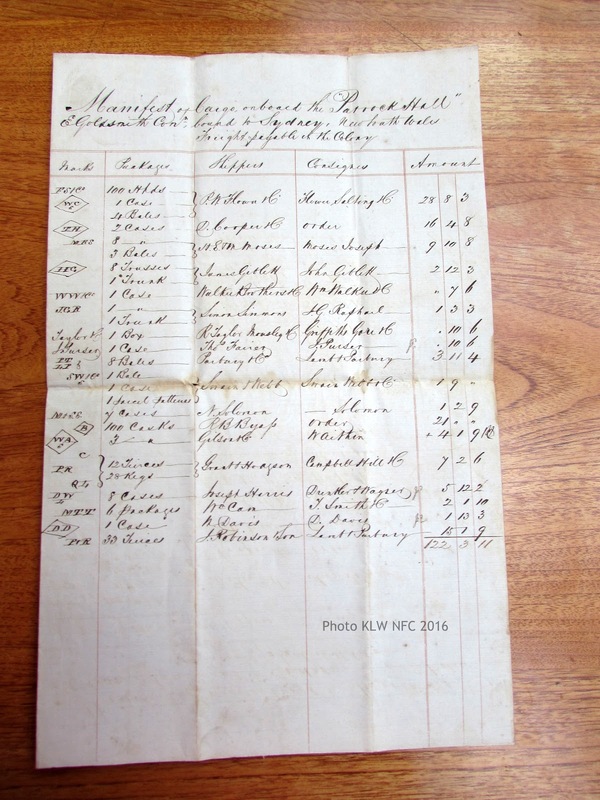 General cargo included a consignment of equipment and uniforms for the 65th Regiment for government Ordnance Stores, fine clothing and furnishings for sale by local merchants, two pianos, alcohol and foodstuffs, stationery, personal effects etc etc (see consignees lists below). 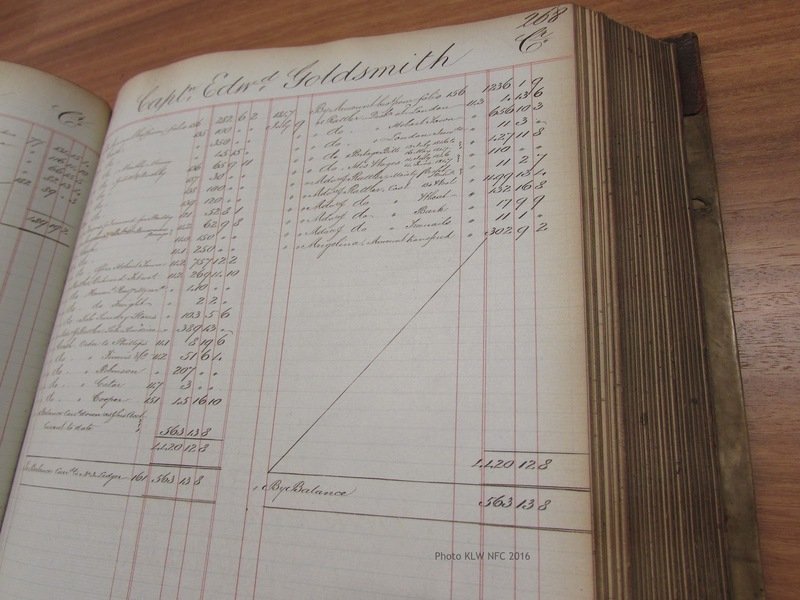 The Goldsmiths stayed two months during a glorious summer in Hobart, departing on the Rattler, 21st January 1847, with nineteen passengers and a cargo of whale products and wool destined for London.